HMD Global is betting on nostalgia and curved glass to get people to buy their new lineup of smartphones. The makers of Nokia-branded phones introduced four new smartphones at Mobile World Congress in Barcelona on Sunday, one of which has gained significant interest among lovers of the colour yellow and The Matrix. 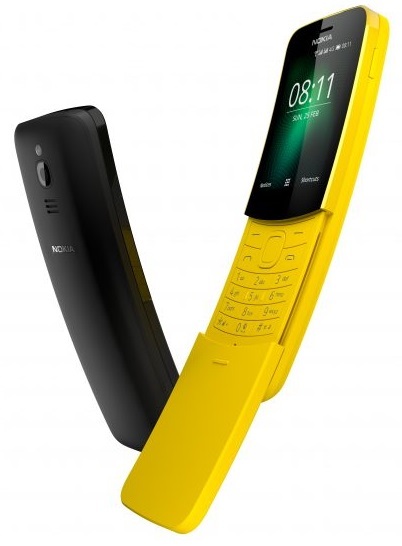 The Nokia 8110 “banana phone” is making a return in May, and comes with a curved handset and a slider that allows for answering and ending calls. It will also come in a traditional black finish. The 8110 includes a 4G connection, access to an app store for a select number of apps including Facebook, Twitter and Google Maps, and the ability to send and receive emails. But the most important feature, however, is a revamped version of Snake. It will come with a price tag of approximately $100 CAD. HMD loves designing classic-looking smartphones, but it’s also doing its best to innovate and compete with the likes of Apple and Samsung. The Nokia 8 Sirocco, which HMD says will be available early April for approximately $1,170 CAD, comes with enhanced Dual-Sight, ZEISS optics, a curved-glass finish and no headphone jack, so you’ll need a USB-C or Bluetooth headphones. The box will come with a USB-C to 3.5 mm headset adapter as well. The phone itself is 2 mm thick and has a 5.5-inch display. HMD also used the introduction of the Sirocco to reiterate Nokia’s commitment to the Android platform, and to take a subtle shot at Apple. “With a pure Android installation, Nokia smartphones come with no unnecessary UI changes or hidden processes that would eat up battery life or slow them down so you can enjoy your new phone for longer,” HMD said on their website. They also announced they’ve become the first global partner to have a full suite of devices selected into the Android One by Google. The Nokia 8110 is the only phone not in that lineup. HMD also announced three other smartphones Sunday, each running on the Android platform. The Nokia 7 Plus includes Dual-Sight, ZEISS optics and a 12MP wide-angle primary camera. HMD is citing the Nokia 7 Plus as the ultimate entertainment viewing device with its six-inch HD display and two-day battery life. It will be available April for approximately $650 CAD. The New Nokia 6 is a slightly slicker, shinier version of its predecessor, the Nokia 5 and will hit the market in April for approximately $435 CAD.